Somalia is, for most Americans, known only as the location of the disastrous 1993 Battle of Mogadishu depicted in 2002's Black Hawk Down. But the east African country has also become the site of Washington's latest escalation of the amorphous war on terror. U.S. airstrikes and boots on the ground have dramatically increased in 2017. This is happening without any public debate, congressional authorization, or the most basic argument from the White House as to how, exactly, this military intervention is obligatory. To all appearances, it is a new theater of war without end or focus, undertaken without due consideration of necessity, unintended consequences, or realistic prospects of conclusion. As the U.S. is currently fighting at least seven foreign wars, depending on how you count them, a review of the facts may be in order here. Somalia is about half the size of Texas but rather more sparsely populated. It boasts probable untapped oil reserves and the longest coastline on the African continent, a coast strategically valuable for its proximity to Gulf states like Saudi Arabia. The nation's post-colonial history has been marked by a military dictatorship fostered, as military historian Ret. Col. Andrew Bacevich notes, by Cold War-era "Soviet-American competition for Somali affections." That contest solidified in the form of both superpowers funneling weapons into the fragile state to satisfy the autocrat's lust for firepower. When the dictatorship finally broke down at the Cold War's end, a United Nations coalition intervened in the ensuing internal conflict. That U.S.-led intervention under the Clinton administration reached its tragic climax in the Battle of Mogadishu. The aftermath of the battle and the public uproar it produced led to drawdowns of American military presence in Somalia, but in retrospect, that change turned out to be more pause than reset. U.S. Africa Command (AFRICOM) began bombing Somalia in 2007, and independent observers have recorded U.S. strikes on the country in all but two years since. The last three years have seen a marked increase in reported strikes as local militants began to declare allegiance to the Islamic State. Where from 2007 to 2014 the busiest year had just three bombings, 2015 through 2017 all have seen double digits, peaking at 26 this year to date. That means more than one-third of the United States' entire post-9/11 bombing campaign (62 confirmed strikes) in Somalia happened in 2017. Even if we limit our count to strikes AFRICOM has announced (18 in 2017), we see the same dramatic upward trend on a slightly smaller scale. And then there are the ground troops. As Politico documented, the "number of U.S. military forces in Somalia has more than doubled this year to over 500 people" — there were just 50 Americans there as recently as early April — "as the Pentagon has quietly posted hundreds of additional special operations personnel to advise local forces in pockets of Islamic militants around the country." The nature of the intervention is reportedly changing, too, with a degree of mission creep setting in as "advise and assist" transforms into battlefield engagement. These 500 troops are the largest U.S. presence in Somalia since the events of Black Hawk Down. While the Pentagon denied to Politico that this tenfold increase could be called a "build-up," it is difficult to see how it could be labeled otherwise. It is even more difficult to see how this escalation is justified, what concrete benefit it will yield for U.S. security, how much it might cost, or when it will ever end. President Trump in March designated Somalia a new "area of active hostility," an Obama-era label which The Guardian reported gives military commanders looser rules about civilian casualties and "the same latitude to launch strikes, raids and campaigns … that they possess in Iraq, Afghanistan, and Syria." The effect is to further formalize executive usurpation of congressional war powers, permitting first Obama and now Trump to quietly wage war — because yes, airstrikes are war — in Somalia without a shred of the formidable public scrutiny to which any such military action ought to be subject before it begins. AFRICOM claims this approach "helps deny terrorists safe havens from which they could attack U.S. citizens or U.S. interests in the regions or our allies." That has not been demonstrated. Moreover, though it may sound sensible at first blush, closer examination shows this laundry list of aims can and does serve to excuse limitless war without regard for cost or consequence. Preventing terrorist attacks on U.S. citizens, U.S. interests in Africa and the greater Mideast, and U.S. allies are all desirable goals — but they cannot all be Washington's goals. To defend U.S. citizens is in our government's purview, but applying external military solutions to the internal turmoil of any and every country in which we have a diplomatic outpost is neither prudent nor feasible. If anything, it exhibits a certain dark irony: Washington has interests in Somalia because of our military intervention there, and the military intervention exists to protect those interests. We are at war in Somalia because we are at war in Somalia; American foreign policy is both the chicken and the egg. 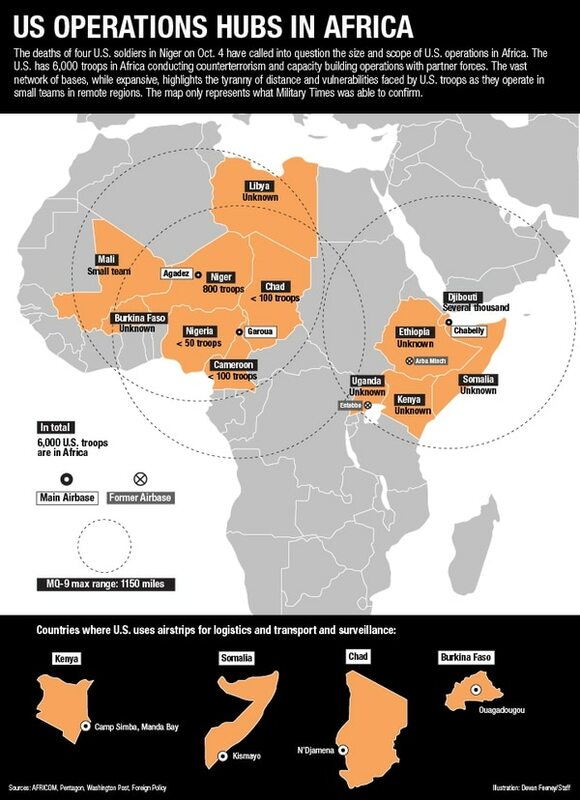 It is worth noting that not a single Somali-born terrorist has committed a lethal terrorist attack on American soil in more than four decades, and that, at any given moment, the Pentagon has about 100 missions active in 20 African countries — missions so little mentioned by Washington that it is difficult to verify basic details like which nations are involved and how many U.S. boots are on the ground. These are the sort of pertinent facts which might come to light had we any real congressional debate or national discussion on the value of putting American troops in harm's way and Somali civilians at risk. Instead, we are saddled with another ill-considered military intervention that may well make Somalia the location of our latest grim disaster.